Holly Lodge provides professional and experienced support for people who have been diagnosed with dementia or who can no longer care for themselves at their own home. 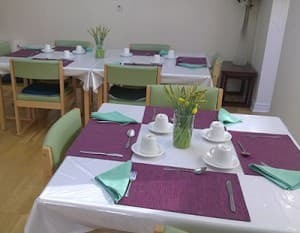 All facilities and catering are available for residents to use and we are extremely flexible when it comes to dietary requirements, helping to make any stay at Holly Lodge as comfortable as possible. For more information about the high-quality facilities and catering available at our care home, call us on 01634 843 588 or get in touch with us through our contact form. We are more than happy to talk you through our services, as well as to arrange a suitable time for you to come and view our home. All rooms at Holly Lodge are designed with the comfort and safety of our residents in mind. With pressure mats beside every bed, we will be alerted to anyone getting out of bed and can assist as necessary. Holly Lodge is a 22-bedded house with a range of bedroom sizes and facilities to accommodate all of our residents. The ground floor comprises of 13 bedrooms, all with private en-suite facilities. The first floor has 4 single bedrooms, with 1 en-suite bathroom, and a twin bedded room. The second floor comprises of 2 bedrooms, 1 single and 1 twin, with both of the rooms possessing an en-suite bathroom. All bedrooms are furnished with a bed, a chest of drawers, a bedside table, a chair, a wardrobe and a lockable box for valuable possessions. Rooms can be decorated by residents and any personal furniture can be brought in to the home, provided it is checked first by our staff to make sure it meets our safety regulations. Several of our bedrooms have en-suite bathroom facilities, but for those that don’t, there are vanity units and washing facilities instead. 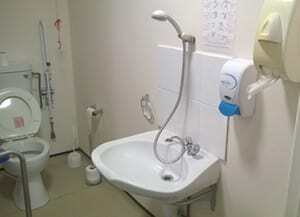 There are communal bathing and washing rooms on the ground floor, with a hoist and hairdresser sink, and a wet room with a shower, toilet and hairdresser sink. Our experienced and friendly staff ensure the best care and service for residents and are happy to help with any requirements they may need. At Holly Lodge we have a communal lounge area where residents can spend time with one another throughout the day. 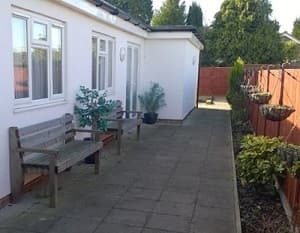 From there, we have a garden and patio area that is secluded and an excellent place for residents to spend some time either alone or with others. Safety and privacy is extremely important to us and anyone wanting to spend time in our communal areas must respect everyone else around them, including visitors to the home. Feel free to look around the home and see what a warm and open environment Holly Lodge is. With new interior design giving us a fresh appearance, make sure to contact us and come over to see for yourself. Residents at Holly Lodge are able to enjoy themselves however they see fit, both individually and with others at the home. Activities and leisure activities are encouraged, with residents able to make use of the facilities at the home in order to promote fitness and a social atmosphere. Staff at Holly Lodge are on hand to help and will offer information and support to anyone in need. Allowing our residents to be as comfortable as possible also includes adhering to any cultural or religious practices they choose to engage in and we are more than happy to accommodate them and will always be on hand to discuss any issues that arise. Emphasis will be on individual participation at the home and residents will be asked to socialise and include themselves in group activities on a regular basis. Activities such as skittles, armchair hockey and bingo are encouraged, but there are plenty of quieter places in the home where residents can go to unwind and relax. Handicrafts and arts can be enjoyed, as well as a television for residents to watch together. Regular trips to the local town centre will be arranged, with residents able to shop with members of staff meaning they won’t have to worry about managing the journey alone. We strive to make our residents as comfortable as possible, which means that their personal care and health are our top priority. At Holly Lodge, we will make sure each service user is registered with a local GP and dental practice for whenever they are needed. Medication is prescribed by the GP and prescriptions will be dispensed for a maximum of a 28-day supply as needed. Managed by Boots, medication is organised using the Boots Monitored dosage system (MDS) by staff, who receive boots’ MDS department training. This means all members of staff who deal with residents’ medication are highly qualified and will make sure your loved one receive the correct medication at the right time. Any additional services such as hairdressing, physiotherapy, optician appointments or chiropody will be on a case by case basis whenever necessary. The individual needs of a resident will be monitored by staff and identified in an assessment. As with our leisure activities, residents are free to eat their meals together in the dining room or alone in their rooms. There is no specific time when meals are prepared for, giving service users the freedom to eat when they choose and wherever they please. Residents can, however, have a weekly meal plan if they so wish. All residents are free to speak to our staff about their specific dietary or cultural needs. We are more than happy to adhere to any religious preferences and will discuss this with any service users that need help. Our current cultural meal plans extend to Indian, Chinese and English food, and we would be happy to discuss any further additions to our catering service for the home. If you would like to learn more about the high quality facilities at Holly Lodge, or come and see them for yourself, then please call us on 01634 843 588, or get in touch through our contact form. We will be more than happy to discuss any requirements you may have and be as flexible as possible.